DREAM - I was working in a large manufacturing plant, very similar to what I worked in, in the 70's and 80's in Milwaukee, WI, but it was not the same company from the looks of it, though it was certainly an old company. My job, as purchasing clerk, which I also did in the 70's and 80's, was to prepare the paperwork for my boss and follow all the procedures, so he could just get on the phone and talk with his buddies and go to lunch, and go visit their plants and chit chat. He had the fun part of the job. I actually did all the work, outside of the manufacturing process itself which the hard working blue collar workers did. I was handed 3 blank purchase orders, along with handwritten notes by the engineer, to manufacture something very precious, and in an extreme emergency situation. Nobody was going home until they were done with this. As it was, it was just before a Holiday, on a Friday, and everybody else was already gone besides the engineer, my boss, and me. And we only had 3 days to get it done. I looked at the paperwork carefully. 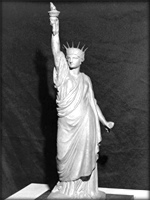 The purchase orders, for which we had to go out for bids on, was for a casting of Lady Liberty. A large one. (You can see Lady Liberty on our old U.S. silver dollars). This one would stand alone, like a statuette. It would be about a foot high ... similar to a Oscar statuette, but female.
. The engineer was trying to explain to me how a casting was made from the pattern. The pattern is constructed in two pieces, such that when the wood is put together, you pour the metal inside of it, and when the casting is pulled apart after the metal cools, you have a perfect statuette or metal part which is then machined and polished for use in conjunction with other parts. I already knew all this from having been in the business for 11 years, but the engineer didn't know I knew this. So, I was patient and listened to his explanation. This pattern was constructed like a round box in two parts. I was ready to type up purchase orders, and then realized my boss would need a pattern card attached to it so he could see who manufactured it before and thus know immediately who to send the bids to. I went to the file cabinet to find the pattern card which was numbered '1058'. When I opened up the pattern card file, all the numbers were in the 8000's range. These were old green battered file cabinets, so this company had been in business a long time. There were no longer any low range numbered cards. That's how long it had been since one of these Lady Liberties had been manufactured. So, I had to get a brand new card (these are light green) and attach it to the requisition and purchase order and notes to give to my boss. I went over to where the cards were stacked. I saw lots of old cards, for parts which we no longer manufactured. Even so those should have been in the file cabinet for record, but weren't. Being done with my part of the work, I was ready to go home for the weekend Holiday. For some reason, there was a little girl there, and she wanted to carry her Teddy Bear home with her, so I took her by the hand to lead her to find the Teddy Bear. The scene switched and I was now outside, walking along a quiet country lane, a narrow path for cars, but not a main road. I saw what looked like an orange cat fur carcass in the bushes. I looked closer, thinking the cat was dead, but it wasn't, it was just resting, all laid out flat. When I looked closer, I saw that it had 9 companions. There were a total of 10 cats of various colors, all laying in the bushes resting. I counted them. I walked a little further, and came across 10 more cats, all resting in the bushes. These all looked similar to the other cats, all different colors and patterns. A little further was 10 more cats, all similar. I realized at this point, all these cats were mine, resembled mine which I fed every day at home, but I obviously wasn't feeding these, they were hunting and feeding themselves. So, there was a total of 30 cats, in 3 clusters of 10. I was getting close to home now, and saw that a farmer had placed a large log across a muddy section between a field and the road, between the bushes. (I wonder if this was the two Presidents ... 'George Bush' of which I was comparing yesterday when I saw them on TV) I couldn't resist walking on it to see if I could balance on it. A bush was overgrown on one side, so it wasn't easy, but I managed to walk easily on this log and balanced. I was pretty proud of myself. Just as I was doing this, an old white, battered car came along the road. It was the newspaper delivery car. I saw that the driver was female. She stopped the car at the mailbox to deliver a paper, then started to get out of the car, waiting to speak to me about something. She was wearing large round sunglasses, looking rather more like a cop, than a newspaper delivery person. She was patiently waiting for me to climb the hill, up to where she was parked, but I was already lucid and waking up and I didn't get that far ... and woke up. NOTE: Comment on the cats. The 30 cats could relate to a zodiac age as having 30 degrees. 360 degrees divided by 12. The cats may be related to Leo the Lion. There are some indications that the time cycle involves half the precession from the age of Leo to the beginning of the Age of Aquarius. The Sphinx for example faced straight towards Leo at the time it was apparently built. The Zodiac sign of Aquarius was directly behind. In the coming Age of Aquarius, it will be reversed. Aquarius is on the horizon now at the Spring Solstice. The Sphinx being the Lion/Man possibly symbolizes those two Zodiac Ages. The Jewish calendar has 12 months of 30 days each. As represented by the camp positions of the 12 tribes in Numbers 2, it is a reflection of the Zodiac. The basic idea is to make things on earth like those in Heaven. The New Jerusalem is based on the same pattern as expressed in Revelation 21. Since we had already made this pattern once before and the newspaper woman symbolizes 'news coming'... can hardly wait to find out what is coming. I may be stretching my hopes a bit, but if you remember the last time there was an event on a Friday before a Holiday and the result gave us 'freedom'.... perhaps we are looking for the 'second coming'....? 4. freedom from captivity, confinement, or physical restraint: The prisoner soon regained his liberty. 5. permission granted to a sailor, esp. in the navy, to go ashore. 6. freedom or right to frequent or use a place: The visitors were given the liberty of the city. 7. unwarranted or impertinent freedom in action or speech, or a form or instance of it: to take liberties. 8. a female figure personifying freedom from despotism. a. free from captivity or restraint. b. unemployed; out of work. c. free to do or be as specified: You are at liberty to leave at any time during the meeting. The Statue of Liberty is the world�s most famous symbol of freedom. It was a symbol of hope to all people arriving in America and is a reminder of how this country became greatthrough the efforts and contributions of its immigrants. 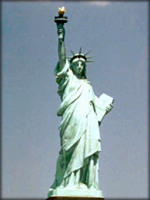 Liberty, her inception, design, construction, historical import, symbolism, emotional impact, relevance to the 1880�s. Why has immigrationt been a significant factor in the history of America? Why, for many, does it still hold the dream and the promise? A French historian suggested the colossus as a gift in 1865. The 151-foot tall statue was erected in 1886. The official history notes that the monument was proposed by French historian Edouard de Laboulaye in 1865 to commemorate the friendship between France and the United States born during the Revolutionary War. De Laboulaye was a leader of the French Abolitionist movement with a commitment to fighting slavery, notes Diane Dayson, the Statue's superintendent. Richard Newman, a research officer at Harvard University's W.E.B. DuBois Institute for Afro-American Research, said it's widely believed in academic circles that de Laboulaye meant for the statue to memorialize the slaves, as well as commemorate the Union victory in the Civil War and the life of Abraham Lincoln. By the time sculptor Frederic Auguste Bartholdi's 27,000 ton statue was erected in New York Harbour, European immigration had begun to rise dramatically, and the statue took on a new symbolism. There is a possibility that a 21-inch model of Lady Liberty completed by Bartholdi in 1870 may have been based on the likeness of a black woman. That model, in the Museum of the City of New York, has a broken chain around its hand; the statue in the harbour has a broken shackle on its foot. Frederic Auguste Bertholdi incorporated symbolism into his statue. The crown Liberty is wearing has seven spikes n twenty-five windows. The spikes represent the seven major seas and seven major continents. The windows represent the total number of seas and continents in the world. The spikes also represent Heaven's Rays shining over the world. The torch that Lady Liberty holds represents lighting the way to freedom. In her left hand she holds a tablet dated July 4, 1776, the day the Declaration of Independence was signed. Her robe is the representation of law and order. Her broken shackles show the breaking away from tyranny, with Liberty's upraised foot leading the way to freedom. HOTLINE ON RELIGIOUS LIBERTY The Court of Appeals reversed. 827 F.2d 1058 (6th Cir. 1987). Each of the three judges on the panel delivered a separate opinion. The first said that compelled exposure to ideas with which one disagreed was not unconstitutional. This judge distinguished Spence v. Bailey, 465 F.2d 797 (6th Cir. 1975), in which the Sixth Circuit had held that a student with religious objections could not be compelled to participate in ROTC classes, on the ground that it involved more active violation of religious beliefs than did "mere" exposure to religiously conflicting ideas. Similarly, Barnette u W:Va. Bd. of Educ., 319 U.S. 624 (1943), holding that Jehovah�s Witnesses could not be compelled to recite the Pledge of Allegiance, was distinguished on the ground that the mandatory recital of the pledge compelled an affirmation of loyalty which the assigned readings did not. This judge apparently would uphold an objection to being forced to read offensive selections aloud or, perhaps, to answering examination questions about objectionable selections. WAS LADY LIBERTY ORIGINALLY MEANT TO MARK THE END OF SLAVERY? Hall for this weighing of the heart. moral order of the universe. great fear falls on those who see them. humanity will make a leap to the Heart chakra, en mass. reached the Heart chakra level.